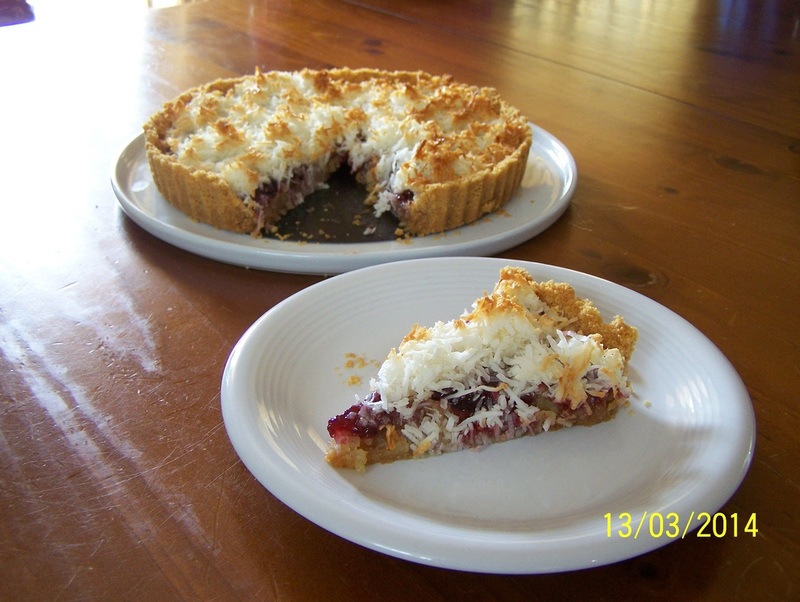 "This tart took me by surprise, I didn't think I'd like it as much as I did"
Why did I make this tart, because it was on the back of the Wagon Wheel Slice I made. I am not a fan of jam really, but I still wanted to make it, so I did. For this tart I did not know what to expect in terms of flavour. I had no idea if I would like it. Well, it surprised me, that I actually do like it. The first bite was it's okay, but with every bite I took, I began to like it more and more. I love the biscuit base, I had never used Nice biscuits in a base before, truly delicious. 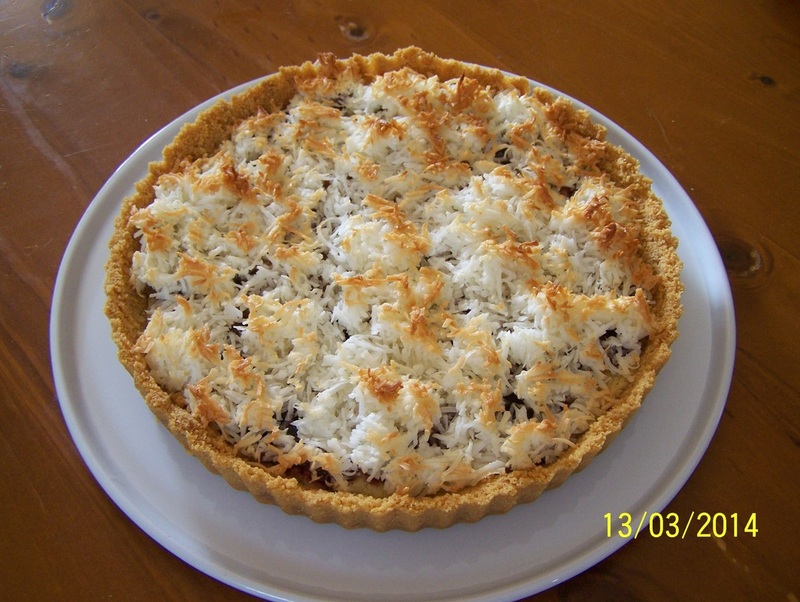 I loved the coconut top, it was chewy and nice. And I loved the jam and frangipane filling. Put it all together it was a good tart, one I would make again. My husband and son who love jam, absolutely loved this dessert. My husband actually is not a big dessert eater and he really went at this one. It is slightly sweeter than my normal desserts, but still not overly sweet. If you love jam and you love coconut you should try this, as if I like it, you will to. Another reason to make it besides it tastes great, is it is simple and cheap to make. With regards to the jam, the only jam I like is Rose's Raspberry Conserve, but use any jam you like. If the jam is thick, you may need to warm it up as the frangipane is soft and hard to spread the jam over. For the base: Place the butter in a heatproof bowl, place bowl over a small saucepan of simmering water until the butter has melted, allow to cool 5 minutes. Place the biscuits in a food processor and blitz until you get a fine breadcrumb consistency. Add the melted butter to the biscuits, stir until combined. Pour the mixture into a 3cm deep, 24cm round loose-based fluted flan tin. Press it up the sides and on the base evenly. (It might feel like you need more butter, but you won't it will hold). Refrigerate for 10 minutes. For the filling: Using an electric mixer, beat the butter and sugar in a bowl until light and fluffy. Add the eggs, beat until combined. Fold in the almonds. Spread the almond mixture over the base carefully. Smooth the top. Bake for 20-25 minutes until golden. For the topping: In a medium sized bowl add the egg whites, shredded coconut and sugar. Mix to coat all the dry ingredients well with the egg white. Carefully spread the jam over the almond filling (it may help to heat the jam a little if thick and cold). Spoon over the coconut mixture. Bake for 25 minutes or until set and golden. Carefully remove from the tin by placing a glass until the tin, then dropping the side of the tin down. Leave the tart on the tin base.